Road trips are a rite of passage, but the inevitable “Are we there yet?” from the back seat doesn’t have to be a part of the scenario. 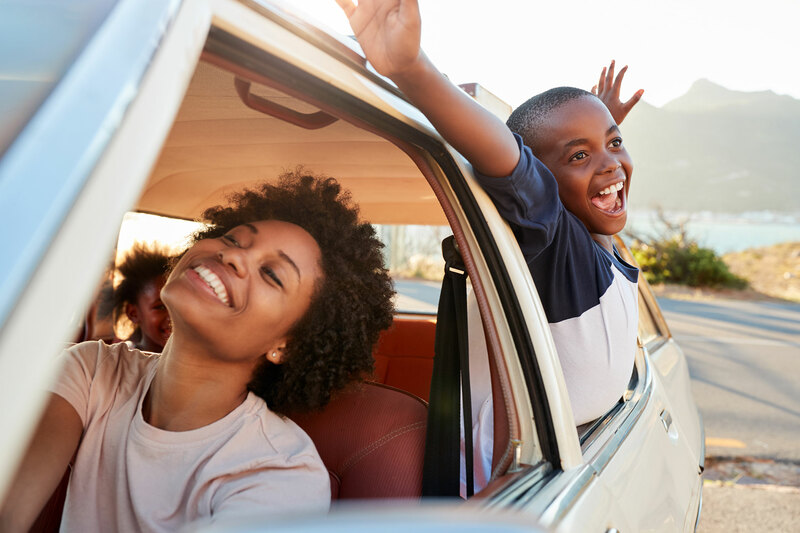 Before you hit the road with your kids, consider these tips for road trips with kids to keep everyone (including you) happy. This will definitely help, especially if your kids are younger. We used to do this when our kids were the 2-and-under set, and it made for a more peaceful experience. Keeping babies or toddlers occupied for even a couple hours at a time is never easy. “Sleeping children meant my husband and I actually had uninterrupted conversations, which in our busy life is rare, and was much appreciated,” says fellow night owl Corinne McDermott, a travel agent and founder of Have Baby Will Travel. Other parents swear by the early morning wake-up call for mastering the road trip. For longer road trips (10-plus hours), it’s often easiest to leave in the middle of the night. While having your partner in the passenger seat is nice for navigation and company, it might be better to put an adult in the back for at least part of the trip. “This will make playing games or simply chatting with the kids a lot easier,” says Jennifer Durbin, author of Baby Traveling Tips for the Clueless Chick. This is especially key when your kids are still riding in car seats that face backward in the car. Movies and travel apps are great, but this is the perfect opportunity to help your kids find more imaginative ways to entertain themselves. “It’s okay to leave them to their own devices and let them be bored,” says Eileen Gunn, founder of FamiliesGo! “When my daughter has absolutely nothing to do in the car, it’s amazing the way her imagination kicks in and she spins all kinds of imaginary scenarios for herself. I think it’s important to give them the space to come up with their own ideas, rather than constantly feed them data with DVDs and video games.” Just use the DVD player and iPad a little more judiciously, and consider playing some classic, electronic-free games instead. We like this road trip hack! Don’t leave your rest stops to chance. Do a little research on your route and find local eateries, great roadside attractions and other spots for a good pit stop. “Find interesting places to stop for breaks, like historic sites, museums, charming towns, and also beautiful places for picnics, including state parks, lakes and waterfalls,” says Lia Batkin of In The Know Experiences, a travel consulting agency. “The important thing is that the kids burn off some energy. The more active they are outside the car, the more likely they are to fall asleep inside.” If nothing else, stopping at a playground for 20 minutes during your family road trip will do the trick. Quarters are a also a good way to keep the kids distracted, and can be used toward souvenirs. Give each child a roll of quarters prior to the trip. Every time they ask how much longer it’ll be until you arrive at your destination, take one quarter away. Family Vacation Critic is a participant in the Amazon Services LLC Associates Program, an affiliate advertising program designed to provide a means for sites to earn advertising fees by advertising and linking to Amazon.com.